Reclaim your living space, free from odor. Maintain your indoor environment with a naturally fresh smell with our odor removal. Kitchen stink, cigarette smoke, musty old house, skunk odor on your car, remove them all. Deodorize a room, your home, auto, business, restroom, or kitchen. Deodorant oxygen is the cleanest way to clean. This is the safest natural purification/disinfectant available. It is the strongest most ideal antimicrobial, bactericide, fungicide, deodorizer, detoxifier, germicide and sanitizing agent used today. Indoor air pollution sources release gasses and particles that are the primary cause of nuisance odors. This machine introduces deodorant oxygen to the foul substance. This foul substance will react and change its chemical nature, become oxidized, and no longer release gas. The length of the treatment depends on the size of the area and the intensity of the odor. Usually, a half-day to three days is all it takes for this deodorization to work. Our machine uses the air in your home to generate deodorant oxygen, which molecularly attacks and destroys the odor. People, pets, and plants must be absent during the treatment. This deodorant oxygen will freshen all physical objects in the treated area in the same way that outdoor air smells fresher after a lightning storm. 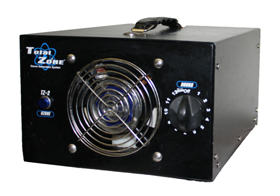 This machine uses the oxygen in your home and causes it to destroy odors. After treatment, the deodorant oxygen will dissipate in less than an hour and revert back to healthy breathable oxygen. If we can ventilate and exchange the air you can return to the location immediately after treatment for odor removal. This is state-of-the-art deodorization technology. Many people have been saved from odors by this fantastic machine.